Oh glorious September! Something chilly touches the air, hues of rust and orange dot the leaves, and the kids scream with excitement to return to school. OK — maybe not, but the kids are gone, I've done my happy dance, and I'm ready to hit Disneyland Resort. By myself. No kids. Let's go. Even as a seasoned guest, I still preplan any visit to Disneyland Resort— I mentally note a few attractions and snacks to enjoy. An attraction may be down, or a line too long for my time frame, so I always have a few different options in mind. In addition to Mouseplanet.com, the Disneyland Resort website is the best tool to preplan any trip. You can check for any closures, special events that might change your course of action, and even look for upcoming entertainment show times. I would recommend also downloading the Disneyland Mobile App, which is basically a transportable version of the website — just at your fingertips - and includes the ability to book MaxPass and Mobile Ordering. Of course, you can still just visit the parks without any itinerary and see where the day takes you. Sometimes, this can be the most magical visit of all. Attractions are the most complex to navigate. Balancing the queue waits against your schedule can be challenging. Here are a few tips to fit in that Guardians of the Galaxy: Mission Breakout! experience you've previously had to bypass with kids in tow. Arrive as early as possible. If you can't make rope drop to either Disneyland Park or Disney California Adventure Park, once you get to your chosen destination, go directly to the attraction Fastpass queue for the earliest pass possible. If you don't already have MaxPass, you can download it via the Disney Mobile App for a $10 daily fee. (Signature and Signature Plus annual passholders already have this option included). This selection gives you the opportunity to choose FastPass from your mobile phone. 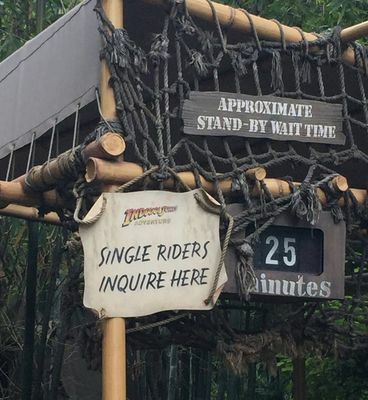 Check for Single Rider lines. Attractions in both parks offer these quick queues so if you're solo or with a small group of friends, take advantage of this option. Disneyland Park Single Rider attractions: Matterhorn Bobsleds, Splash Mountain, Indiana Jones Adventure, Space Mountain. Disney California Adventure Park Single Rider attractions: Grizzly River Run, Goofy's Sky School, Incredicoaster, Radiator Springs Racers. Single Rider lines can cut down queue time immensely to help you fit all your activities within your time frame. Photo by Megan Walker. I'm a Disney foodie and being able to savor edible delights without having to share is a big part of my Disneyland Resort visits. Plus, I can have what I want, when I want, where I want—without having to share. Hey, it's the little things! My own Oswald Sundae from Clarabelle's Hand Scooped Ice cream? Yes please! A succulent, sweet lobster roll at Harbour Galley instead of the kids' stand-by tacos at Rancho del Zocalo Restaurante? Sign me up! Harbour Galley's seafood menu is a surprise delight amid the typical turkey legs and burgers at the resort. Stop on by the location on the way to Critter Country. Photo by Lisa Stiglic. And, try out the new Mobile Food and Beverage ordering option on the Disney Mobile App. This recent feature is a great time-saver. Mobile Ordering Disneyland Park participating restaurants: Bengal Barbecue, Galactic Grill, Gibson Girl Ice Cream Parlor, Harbour Galley, Hungry Bear Restaurant, Jolly Holiday Bakery Cafe, Red Rose Tavern, Tiki Juice Bar. Mobile Ordering Disney California Adventure Park participating restaurants: Award Weiners, Bayside Brews, Clarabelle's Hand Scooped Ice Cream, Cocina Cucamonga Mexican Grill, Corn Dog Castle, Flo's V8 Cafe, Lucky Fortune Cookery, Pacific Wharf Cafe, Paradise Garden Grill, Smokejumpers Grill. Ironically, you cannot mobile order at either Starbucks location in the park (you can at Downtown Disney). Revel in the entertainment! Disney is an entertainment company, which means both parks have continuous shows, music, and character interactions. I'm the only music/theater/Disney soundtrack geek in my family, so all these spectacular productions are skipped when I'm visiting with the family. Needless to say, I ensure I schedule a few each time I visit solo. If you have the time, definitely plan for the longer shows, such as Mickey and the Magical Map in Disneyland, and Frozen-Live at the Hyperion in Disney California Adventure Park. Times are listed in the daily guide, and again, you can view show times with the Disneyland Mobile App. If you only have minimal time, much like myself, check to see which street band may be up next. Disneyland Park favorites include Main Street U.S.A.'s Dapper Dans, and the Boot Strappers pirate gang in New Orleans Square. My personal favorite is Disney California Adventure's Red Car Trolley Boys who share in song Mickey's arrival to Hollywood and his rise to stardom, much like a certain fellow named Disney. Buena Vista Street is a busy place with the Red Car Trolley Boys sharing their dreams with the crowds. Photo by Todd Pickering. Visiting the parks with a group, especially kiddos of any age, can be exhausting because you're usually on a timeline to get in as many attractions and shows as possible, while balancing everyone's priorities. Not only is going solo a chance to pace yourself, but you can view another side of Disneyland Resort you might not usually see—the guests. Plenty of great viewing spots dot both parks, but Main Street U.S.A. is the best for people watching. I try to spy Disneybounding guests (people who dress up in outfits influenced by favorite Disney characters or themes), and look for "the plaids." (Disney tour guides who usually host VIP tours which could mean celebrities). Sometimes, it's just nice to sit for a half-hour and regroup while soaking up the surrounding Disney magic, too. 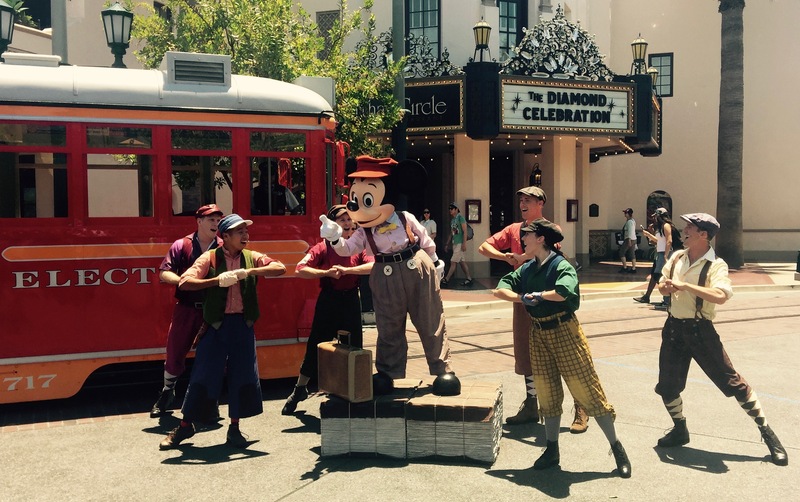 Disneybounding is extremely popular during Dapper Days but can be spotted any day at Disneyland Resort. Photo by Lisa Stiglic. Besides the peace and quiet of going alone, all attention is just on you. Perusing the shops throughout the Resort is a definite must for your Disney alone-time. I'm not a shopper by any means, but I enjoy looking through the latest pin releases, recent trends, and upcoming holiday merchandise just the same. My favorite location in which to browse is Disneyana on Main Street U.S.A. The shop is adjacent to the Disney Gallery, which hosts ongoing exhibits featuring Disney and Disneyland history. Disneyana offers buyers and even browsers, entertaining and interesting collectibles. Photo by Lisa Stiglic. Without a doubt, I revel in my Disneyland Resort days without my kids. I know they are slaving away in the classroom while I'm singing along with Five and Dime—Buena Vista Street's showcase band—so maybe I do feel a tad guilty. Or not. But, they still win in the end, because I always bring home the latest cake pop for them to devour. Guilt eased. Minor correction to the article. Only Signature Plus APs include MaxPass. I'm a Central Floridian, but am a big fan of Solo Trips to the World. I can't stress enough the downtime thing... there is an urge to do EVERYTHING and go as quickly as possible around the park, especially if there are rides you don't normally get to do b/c of the kids. But resist the urge... there is no checklist, there is no requirement to do everything, just do what you like, and when you're done, you're done. Remember- it's Disney- you're to have fun!